A month ago jlrevilla commented on my 30 April post on non-local realism with a link to the article the movies in our eyes in the April issue of Scientific American. I am finally following up on jlrevilla's suggestion. Essentially this article is a well-written account of some of the processing taking place in the retina's early mechanisms. Anybody who still imagines the eye as a sort of camcorder should read this article, which can be found in any library. The article is an easy read and reports on the latest results in this research area. Building on Santiago Ramón y Cajal's original work on the retina's physiology, the authors quickly fast-forward to the latest physiological findings. Very well made illustrations allow readers to immediately grasp the complexity of the early mechanisms in the retina, like the non-intuitive fact that the rods and cones point inwards towards the brain, so that the image has to be detected through all the "wet mess" in the retina. One aspect that is maybe oversimplified is that the reader could easily assume that color vision is hierarchical, i.e., that the visual signals follow the simple model of a distal event causing a proximal stimulus in the retina, which in turn causes a brain event. 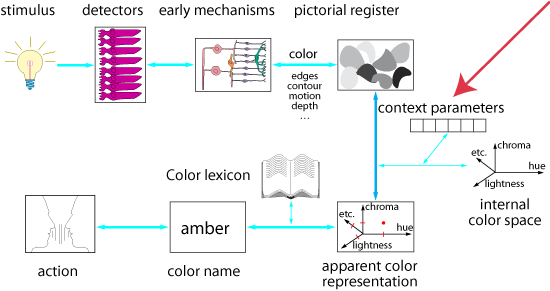 In fact, there are about 26 known areas of visual processing and feedback loops exist between all of them, as indicated by the bidirectional arrows in this simple cognitive model for color appearance. It has been proven that a necessary condition of some activity in even the primary visual cortex is input from “higher” areas. In essence, vision is not a bottom-up process, in the sense that the “inner eye's” function is not to understand what the sensory states indicate. A top-down model is that we have a model of the exterior visual world and then use the visual system to confirm or revise this model. This is how sleep researchers know when we are dreaming  our eyes are moving during the so-called REM (rapid eye movement) sleep. For more see Science 17 March 2006: Vol. 311. no. 5767, pp. 1606 - 1609. However, even this is an oversimplification. For example, a rapid movement in the periphery can immediately activate the amygdala through the magnocellular pathway. In fact, if you read or write on your desk and have a large CRT in your peripheral view, this is what gives you a headache  it is the continuous stimulation of the amygdala and cancelling the alarm through a subconscious verification that the trigger is just a CRT. Another oversimplification is that many sensory signals are non-correlational  a given signal does not always indicate the same property or event in the world. Finally, it is important to notice that the signals from the retinal ganglion cells to the lateral geniculate nucleus are not amplitude encoded, they are frequency encoded and more than one signal can be multiplexed on a single optical nerve. This actually created a moment of panic at the 1993 AIC congress in Budapest, because the flicker frequency used in many old psychophysics experiments related to color perception was between the typical modulation frequencies of chromatic and luminance signals, meaning that old experiments might actually have shut off certain channels and delivered incorrect results.